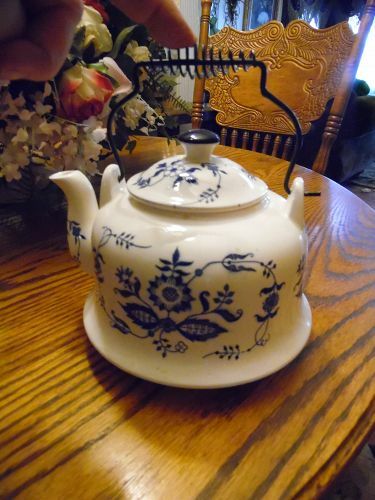 Vintage white ceramic with blue design teapot. Great to serve tea or sit on a shelf. 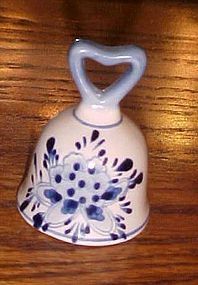 The pattern would compliment a Blue Onion or Delft collection. This pattern also known as blue danube, and blue nordic. This was probably made in japan. The teapot is about 6" tall and 6" wide. The lid is notched so it doesn't fall off when pouring. It is white ceramic with blue design for a glossy surface. The handle is a curly iron handle. The teapot is in good vintage condition with no cracks or chips. Vintage Inarco Blue Mood Indigo relish or lunch plate E-2376 Very nice. I have 5 available, and these are hard to find. All nice and damage free. Price is per plate. Measures 5 3//4" x 8 1/2". 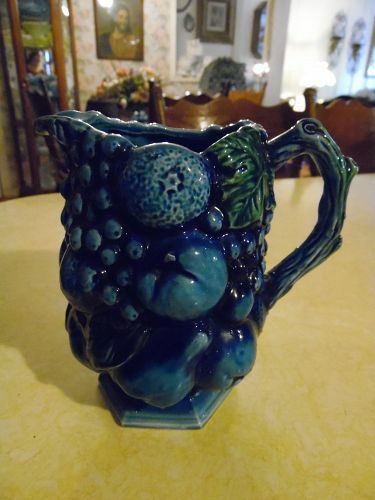 Vintage Inarco Blue Mood Indigo Pitcher E-2429 Very nice.No chips or cracks and has original Inarco foil sticker. 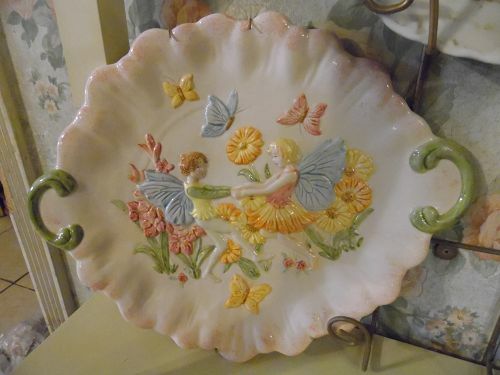 This platter is a must for the fairy collector. 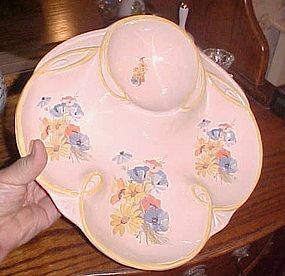 Platter is made of ceramic and the fairies, flowers, and butterflies are all in relief mold and are hand painted under glaze. Measures 14 1/4 x 11 1/4" . Previous owner had it displayed on the wall so I will include the hanger with it at no charge extra. No chips or cracks. 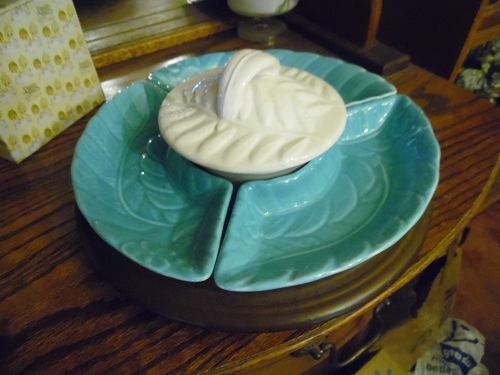 Wow... look at this pretty vintage turquoise and white ceramic lazy susan set. Marked Calif USA 709. Three side sections and a center covered dish. Sits on a wood lazy susan turntable. Wonderful condition. One very tiny chip on the underside of the white dish that is barely noticeable. Wood turntable is 12" diameter. Mid-Century Vintage MADDUX Of California USA Donkey Figurine - #60 321 - Rare! Colors are bright and the finish is a glossy pearl lustre. Perfect condition with NO damages or repairs. This would be a real conversation piece on any shelf. 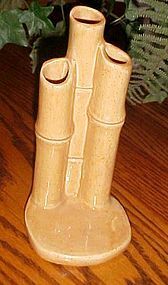 Figurine measures: 3 5/8" long, 3 5/8" wide, 8 1/2" tall. Well marked in the mold on the bottom of figurine. 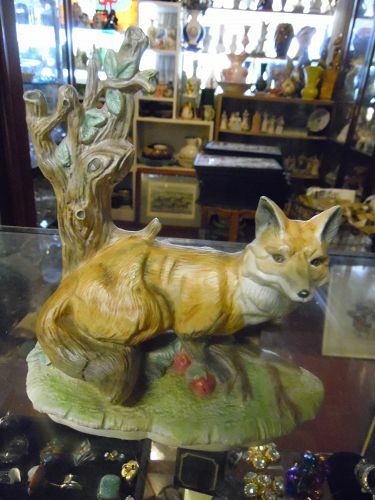 Nice hand painted fox figurine measures 8 3/4" tall to the tallest point. 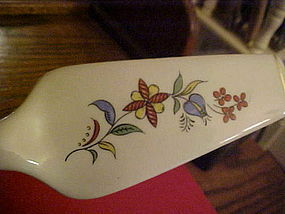 Made of ceramic, and was probably hand painted at home or in ceramic class. Very nice and realistic looking. Perfect condition. 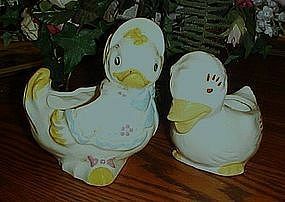 wonderful vintage pair of little duck nursery planters for baby's room Made of hand painted ceramic. All decoration is under glaze. She measures 5 3/4" tall and he is 4 3/4" tall. No chips, cracks or repairs. This is a very sweet set. 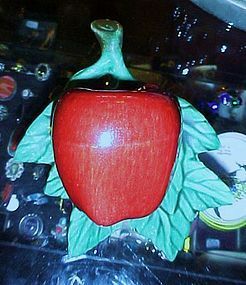 A great vintage apple wall pocket made of glazed ceramic. No makings on the back. Measures 7 5/8" x 6 1/2". 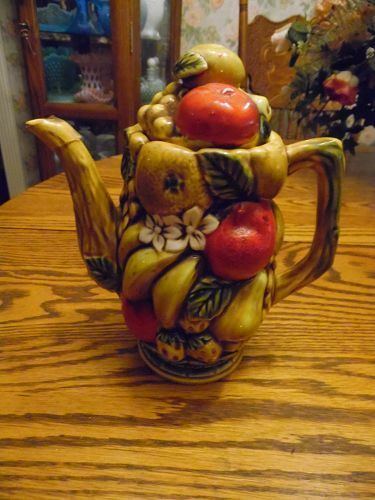 This would look awesome in your kitchen if you collect the Franciscan apple pattern or just apples in general. No chips or damages. 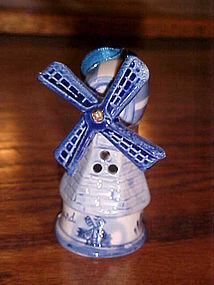 A vintage Holland delft windmill ornament, hand painted delft blue. Movable blades and original blue hang ribbon. Measures total of 3 1/2" No chips or damages. Holland painted on the side. I will be listing a few more similar ones. 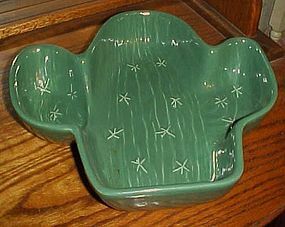 Great for chips or whatever suits you, you will be serving it in style with this big saguaro cactus shape bowl! In great vintage condition, very little if any wear, no dings etc.. it measures ~13" x 13" x 2.5" deep. Very nice detail on the glaze! Retro serving wear at it's finest! Marked Treasure Craft. Great if you have a southwestern theme or when serving Mexican food. 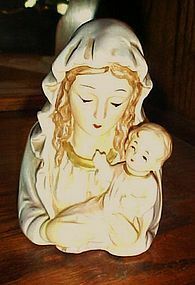 Beautiful vintage Napco Madonna and child planter vase. Original Napco sticker on the bottom. Stamped R-7075. Gorgeous and hand painted. Perfect condition with no chips or cracks. 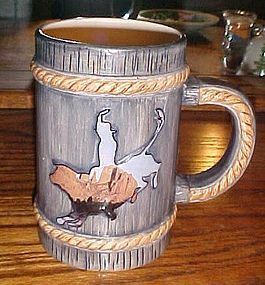 Russ ceramic beer mug would be perfect for the bull rider. Appears to never been used. Original paper sticker on the bottom. Rope look trim. 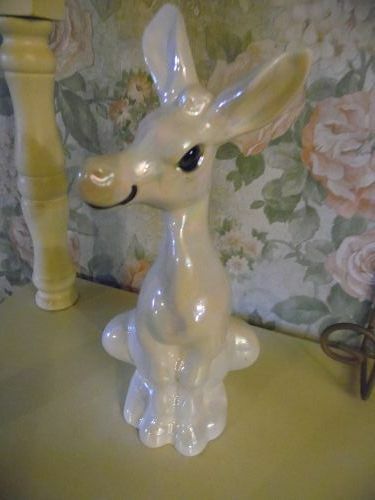 Measures 5 5/8" tall. 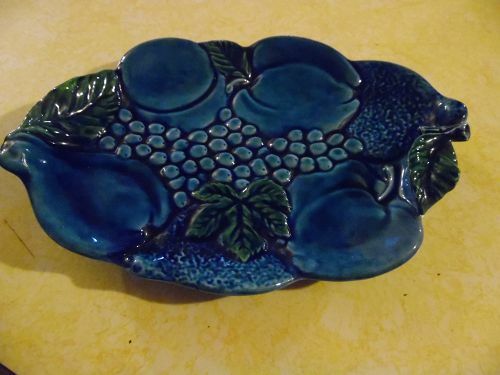 A lovely serving dish made by California Originals. Number #1142. Decorated with pretty yellow orange and blue flowers with a pretty yellow border trim. Perfect with no chips cracks or crazing. Measures 12 3/4" by 12 1/2". Nice 2" depth.